You've found the “U.S. Plymouth Rock Chicken Breeders” page here at Hobby Farm Wisdom! If this is the first time you have visited our site: Welcome! 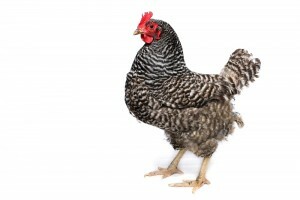 The Plymouth Rock chicken is one of the most popular breeds for small farms today and is commonly referred to as “Barred Rock.” Even though their exactly heritage is unknown, they have several positive characteristics that make them the perfect bird for small farms and backyards. Plymouth Rock chickens are very friendly and can be handled easily. They get along well with people, other breed of chickens and other animals. While they prefer to be free ranging, they do well in confinement and are very hardy in cold weather. These birds are excellent egg layers, producing large brown eggs and rarely go broody. There are eight color variety recognized by most of the world, including barred, white, buff, partridge, silver penciled, blue, Columbian and black.